If capitalism had a comeback in 2016, then why are we seeing a rise in socialist supremacy supporters in 2018? Capitalism trumped socialism in our last presidential election. Donald Trump won the 2016 election in large part due to the American working class. Hardworking Americans wanted to keep what they earned (capitalism) as opposed to having to give it up, by force, and watch that money be given away to those who didn't earn it at all (socialism). Andy Puzder gave this victory a great name: The Capitalist Comeback. The election of a president who supported capitalism became an issue of outrage for a small faction of angry socialists who believed in the destruction of private property rights—and destruction of property altogether. They claimed anyone who disagreed with them was a fascist and hence a capitalist (which is a significant logical error on their part, since fascists are in fact socialists, not capitalists). Antifa is what they called themselves, coming from the term anti-fascists. (They should more honestly call themselves Antica—because, in reality, they are just anti-capitalist.) They spent the past two years destroying private property and committing violent acts. The most intriguing aspect of the Antifa movement is that they have been growing and gaining popularity on the left. CNN's Chris Cuomo came out in support of Antifa and their violence on national television, calling them "right." Democrat National Committee deputy chair Keith Ellison also came out publicly in support of Antifa, taking a smiling selfie while holding the Antifa handbook. But why are the Democrats so supportive of violence? Democrats, socialists, and leftists of all kind, have an ethical unity: they believe that the ends justify the means. And that ethical position justifies Antifa and the members' violent actions in entirety. So when Antifa attacks random police officers and media reporters, the left covers up for them. But are these socialists really that different from the fascists that they hate? No, they're not. They're the same breed of idiot. Ayn Rand put it best when she said, “Fascism, Nazism, Communism and Socialism are only superficial variations of the same monstrous theme—collectivism.” In fact, watching the fascist white supremacists v. the Antifa socialist supremacists in Charlottesville and D.C. these past two years was like watching a fight between two sides of the same pancake. Which brings me to the term that I have been using to describe Antifa, "socialist supremacists." If "white supremacist" is the correct term to describe someone who believes in his inherent superiority based on his pro-white beliefs, then "socialist supremacist" is the correct term to describe someone who believes in his inherent superiority based on his pro-socialist beliefs. Nazis and Antifa both believe in their inherent superiority. Both groups similarly believe in violence to achieve their goals, and both groups agree that the ends justify the means. In fact, Antifa has been learning from the Nazi side of the pancake that marching the streets while chanting idiocies in unison to Nazi rhymes is a great way to celebrate their inherent supremacy. But didn't Capitalism win in 2016? American capitalist Puzder even wrote a book to prove it: The Capitalist Comeback. So what happened? Why are we experiencing a rise in socialism in our local elections, with openly socialist candidates like Alexandria Ocasio-Cortez winning over moderate Democrats? Why are we seeing a rise in support for violent socialist supremacists who call themselves Antifa? And what does this have to do with hating the police and singing about it to Nazi tunes? To find the answers, I went to go to the expert on the battle of capitalism v. socialism in America, Andy Puzder. Here is Andy v. Antifa. Didn't capitalism win in 2016? Why are we seeing a rise in support for socialist supremacists who call themselves Antifa? "The capitalist candidate certainly did win the 2016 election. I don’t think there was any doubt in most peoples’ minds that the New York real estate developer and entrepreneur was a capitalist. For socialist supremacists, the result of President Trump’s victory was utter and irreconcilable frustration. "But why was Trump’s election so impactful for young Americans, who make up the majority of Antifa’s supporters? According to a recent Gallup poll young Americans are actually more positive about socialism (51%) than capitalism (45%). More disturbingly, the percentage of young Americans with a positive view of capitalism has declined 23 points since 2010 when 68% viewed capitalism positively. "That’s not totally surprising, they just lived through 8 years of the Obama administration where the press touted President Obama’s economic accomplishments at every opportunity despite the fact that economic growth was anemic – the worst of any post WWII president – quality jobs were scarce, income inequality increased and the middle class was decimated. Coming out of a recession, economic growth should have been tremendous. It was not. "However, most have been educated in a system controlled by socialist supremacists – and inundated with leftist ideology as entertainment. Rather than blaming Obama’s big government economic policies, young Americans have been conditioned to blame every economic problem on capitalism. They have been fed the lie that capitalism is based on greed while socialism is benevolent. This is a strange argument because, in a capitalist economy, the way you succeed is by meeting the needs of others. No matter what product or service you are providing, you will only succeed if meet the needs of a broad base of consumers who - in a form of economic democracy - vote with every dollar they spend on which businesses will succeed and which will fail. Capitalism takes the desire of every person to improve his or her life and directs it towards the needs of others. That may not be totally selfless conduct, but it isn’t greedy. Under socialism, on the other hand, you improve your life by getting more for yourself from a limited supply of goods or services the government makes available to the exclusion of others. Whether waiting in the inevitable bread line or the line for gasoline, your concern isn’t the needs of those in front or behind you. Its how to get the most for yourself. That’s a lot closer to greed than benevolence. "We are now experiencing a tremendous economic surge because our capitalist president cut taxes, eviscerated Obama’s regulatory onslaught and incentivized the development of domestic energy, basically reversing every one of President Obama’s growth retarding Progressive economic policies. This Trump economic boom is benefitting people from every class and of every race. Hopefully, reality will help young Americans see through the lies of the Left. When that happens, groups like Antifa will have few supporters." Based on your knowledge of socialist uprisings throughout US history, is the Antifa uprising something that we should be concerned with? "We should always be concerned whenever socialism raises its head in America – or anywhere else. American capitalism has spread more wealth across broader demographics than any economic system in history. Socialism has been an abject failure in every nation in which it has been tried, but it appeals to elites who want to see themselves as the vanguard of the future. Those elites are desperately trying to maintain their illusions; they won’t be able to do it for long, but in the meantime, they cause a lot of damage. Unfortunately, younger Americans have been subjected to an education system and an entertainment industry more committed to leftist ideology that has been the case at any other time in our nation’s history. "Many of us thought that the fall of the Soviet Union would have put the final nail in the coffin for American socialists. I had this to say in Chapter 5 of my book about the crisis of belief on the Left:"
"For the Progressive Left, the collapse of the Soviet Union and the ascendancy of capitalism was a disaster. It put the lie too often repeated claims of a socialist workers’ paradise. The joke at the time was that the only place you could find a Marxist was in the faculty lounge at Harvard. Unfortunately, those faculty lounge Marxists have grown in number and taken over our institutions of higher education while leftists dominate the entertainment industry. They’ve created a bubble in which they indoctrinate young people. The result is a generation of Americans vulnerable to the lies and deceit of socialism. Some of them march in rallies for Antifa. Yes, it is something about which we should be very concerned." Why does Antifa hate our police officers? "The police stand as the guardians of peace and order, preserving an environment in which different groups can express views under the First Amendment in a peaceful manner. This is one of the things that distinguishes the United States from the nations ruled by the very fascist governments Antifa claims to so vehemently oppose. The police are an impediment to terrorist violence, so they are a clear threat to Antifa’s efforts to subvert free expression and terrorize the American people." Why did these socialist supremacists chant “all police are racist” in replacement of the Nazi words “you will not replace us,” but to the same Nazi tune, during Antifa's 2018 Charlottesville march? "It’s an attempt to disparage the police and align them with the targets of Antifa’s terrorist activities. It feeds into anti-police sentiment on the Left. 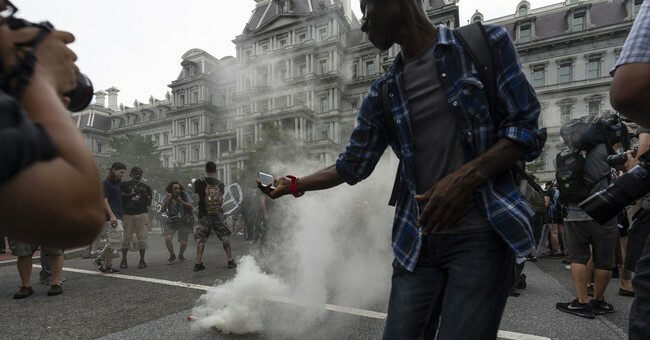 "Keep in mind that Washington DC, where Antifa was also disparaging the police, has a total population that is 64.5% minority and the police department is 68.4% minorities. African Americans make up 48.7% of the DC population and 59.3% of the police force. These numbers are from 2013, which are the most recent I’ve seen. Although no one knows for sure, based on the videos I’ve seen, I suspect that the DC police department has better minority representation than Antifa." Why is the media so concerned with protecting leftist violence from bad press? Why does the media value socialism above truth? Is this something that we have seen in American culture in the past? "Yes, we have seen it before. Just look at the obsequious coverage that the New York Times gave to the Soviet Union in the 1930s. There is a long progressive media tradition that they have no enemies on the Left, and that is in full display in their coverage of Antifa. "It’s also important to remember that the Left (including much of the press) is still convinced that the direction of history is in their favor. They are “progressive”, after all – they believe history is progressing towards the inevitable vindication of what they believe. They have a tremendous ego investment in that certainty. But it is increasingly difficult for them to sustain that investment against the weight of evidence of the last 100 years. So, every day they have to ignore the truth that is all around them to believe what they feel impelled to believe. After a while ignoring the truth becomes a habit, and we see that habit in action when they report (or don’t report) on Antifa. "I think this fear of the truth is the cause of much of the media’s utter hatred for President Trump. The President doesn’t hide his contempt for their moral authority, their identity politics, their vision of the future, and their influence on the culture. The fact that Trump is president, and that he won’t back down, is for them an intolerable assault on things they hold sacred. They can’t even humanize Trump without threatening their own sense of identity." What is your advice to a conservative on how to handle Antifa or socialist supremacists in a conversation, knowing that an appeal to reason does not work when communicating with them? "You’ll need to be prepared yourself if you are going to engage young people in a conversation like that. I’d get a copy of my book. That’s why I wrote it." To summarize, Andy attributes the rise of socialist supremacists and Antifa to young people blaming all of society's economic ills on capitalism. I agree with him. I believe this is a perpetual, fundamental misunderstanding by our youth of why an economic problem exists in the first place. Instead of understanding the nature of personal responsibility, quality work, the marketplace, supply and demand, and market value, our youth just understands a superficial visual comparison: rich and poor. Failing to properly educate our children about capitalism and socialism is the greatest tragedy of our seemingly capitalist-wannabe nation. To better educate our youth, go get a copy of Andy's book. He writes about the outrageous ways that socialists have been gaining power throughout America's history. He explains the history, development and the mindset the socialist left. The more you know and understand about what led to modern day Antifa, the more empowered you will be to educate your children, and the better prepared you will be to stand your ground if faced with an argument with or about socialist supremacy. Reinvigorate and reinforce The Capitalist Comeback.